Last Minute Special. 25% discount off the VRBO posted rates for any available dates in April and May, 2019. Exclusive Sand Dollar--Request discounted quote. 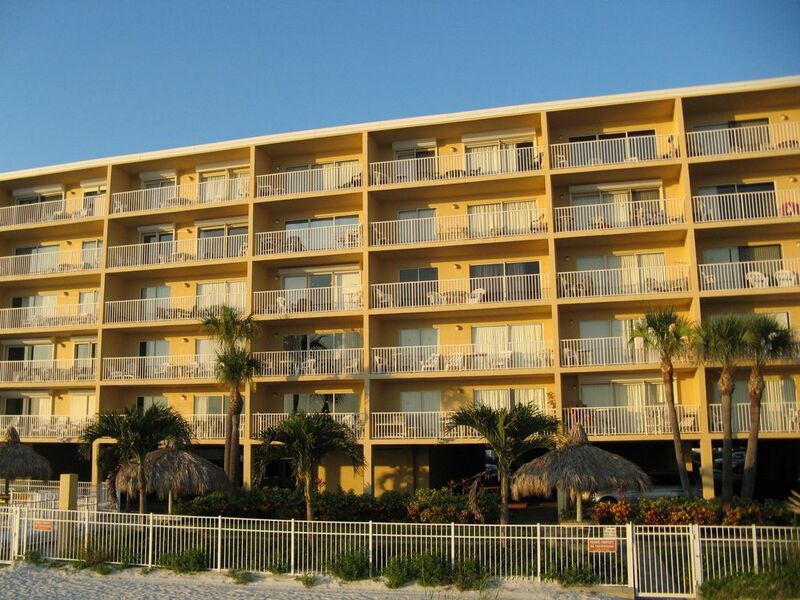 Very large fourth floor Gulf front, deluxe, three bedroom Condo located directly on 15 miles of wide white sand beach at exclusive Sand Dollar Condominiums. Living room and large master bedroom overlook the Gulf and open onto a large balcony. Large second and third bedrooms have view over the Intercoastal Waterway. Master bedroom has 2 queen beds, second bedroom 2 queen beds,third bedroom has 1 queen bed. All bedrooms have LCD TV & DVD. Full kitchen, glass top range, 26 CF frig with water/ice thru door, microwave, dishwasher. 50 inch hi-def TV in living room. High speed internet along with high speed WIFI are provided. Beautiful tropical landscaping with 30 palm trees, large heated salt water pool, hot tub, 6 tiki huts and several grills all located directly on the beach. Sleep to the sound of the surf, read a book under one of the beachside tiki huts, fish or dolphin watch from the private pier, swim in the large heated pool or relax in the hot tub(both lighted and open till 11:00 PM), grill out on the beach, or watch the sunsets from your private balcony. There are many attractions in the area, including Busch Gardens(60 min), Disney World(under 2 hours), and several great state parks, but you will not want to be away for long. Pack light, washer and dryer are in the unit. Membership in nearby gym included. Check calendar for availability and ask about discount for your selected dates. Engineering geologist. Retired after 35 years of service with the US Environmental Protection Agency where I specialized in clean-up of hazardous waste sites. Veteran, Army Corps of Engineers. President Sand Dollar Condominium Association. Reside in Cincinnati, Ohio along with 4 rescue dogs. I have travelled to many areas in Florida. This part of Florida between Clearwater Beach and St Petersburg Beach is the most beautiful and relaxing part of Florida, yet convenient to many facilities and attractions. The 15 miles of wide white sand beaches are fantastic and are suitable for swiming, walking, running, and even bicycles as the sand is firm near the tide line yet fluffy back from the tide. Great breakfasts and sunsets on the balcony overlooking the beach and Gulf,great tropical garden on the beach with palms, tiki huts, hot tub, and pool all beachside. Great restraunts in the area and a family oriented condo atmosphere. Be sure to visit some of the great Florida State Parks in the area including Honeymoon Island, Caladesi Island, Myakka River and Egmont Key, featuring trails,boat rides, kayaks,bird watching, and even alligators. Two large full bathrooms, each with large granite counter with double sinks and lots of cabinets. Beautiful clear view over the Gulf of Mexico from large private beach front balcony. All bed linens and towels provided. Bring beach towels if desired. Large capacity washer and dryer in unit. Large capacity clothes washer and dryer in unit. Two parking spaces available upon request. Bath towels, wash cloths, provided. Kitchen towels provided. Hi speed WIFI throughout unit. Toaster, can opener, blender, are provided. Very modern and updated with expansive granite counters and deluxe appliances. Dining table seats 6, expands to seat 8. Raised granite counter bar with 4 bar stools. Owner recommends the two tables located on the large balcony so as to enjoy the view over the beach and Gulf. Misc books in unit. Find a favorite you just can not part with? Take it, but leave one in its place. Ask desk for pool/beach toys. Fishing rods/reels in unit. But do obtain a license. No Bicycles are provided. However they are available for rental nearby. Ask directions from the on-site desk. Many local courses open all year. Ask the on-site desk for directions. Private pier in the Gulf of Mexico. 6 tiki huts on beach. Wide screen high def TV. Gym membership included. The condo is clean, spacious, well furnished and well stocked with everything you need for an enjoyable stay. We appreciated the owner taking initiative to communicate with us. Ed is so helpful and informative and you can tell he genuinely cares about his guests having an enjoyable stay. He has included a lot of helpful details in his listing and it is all accurate. Here are some additional details that might be helpful. The front desk staff are friendly and helpful and presented us with a packet full of information about the area. They provide bar soap (like hotel soap), trash bags and detergent tablets for the dishwasher. The couch/loveseat in the living room and the beds in the master bedroom were all very comfortable. Between the quality of the mattresses and the ocean breeze each night, we got great sleep! The internet service was excellent. We enjoyed the use of some good quality beach chairs (stored in closet of 3rd bedroom) and a soft side cooler (stored in the laundry room). The hot tub and swimming pool are kept at perfect temperatures and are open until 11:00 each night. The balcony is a nice size and actually has two tables with several tall chairs for great views of the Gulf. We enjoyed watching dolphins one evening as the sun was setting. And when I say "enjoyed", I mean we were jumping up and down like little kids. We ate at several great restaurants in the area and highly recommend Keegan's Seafood Grille (have the homemade sangria, the crab soup and the Key Lime pie!) and Guppy's on the Beach (have the fish spread, the shrimp and grits and the Key Lime pie!). Thanks, Ed, for such a lovely stay at a great beach! We have stayed here for a number of years and enjoy it all the time. Ed Bates, the owner, is such a great person and does everything in his power to make sure there are no problems with his condo. Well equipped with anything you might need. The girls at the front desk are so helpful with any questions you might have and give you the heads up on all the good places to eat. Just love visiting this place! Thank you Sandy for you unsolicited review. I am delighted that you had a great time and look forward to your return. WOW! Truly a home away from from home! This place is truly amazing! Ed takes great care of this property and shows that he wants his guests to enjoy their stay. Nearly everything you might need was provided; from kitchen accessories to beach toys and fishing poles. The kitchen had all the pots, pans, dishes, and utensils you need! The little luggage cart was a great bonus when the bell carts were in use during checkout. Even the little details, like the themed bedrooms were a nice touch. The views off the balcony were spectacular. Make sure you wake up early, you just might get to see dolphins swimming off the coast. The sunsets are like those off of a post card. As far as Sand Dollar itself, The pool and hot tub were both nice. You are literally steps from the beach and it's quiet. There are cute little tiki huts/picnic tables outside and grills. The front desk staff was very friendly and helpful. This is also a great central location for activities. There's a Seabird Sanctuary maybe a block down the street. Clearwater Aquarium (where Hope and Winter from A Dolphin's Tale reside, a great highlight for my kids), John's Pass Village, Honeymoon Island, and Tarpon Springs are all great places locally with so much to do! We need to plan another trip just to get everything in! Other helpful info is that the shuttle from the Tampa Airport will go to Sand Dollar (My parents flew in to meet us there). There is a fee, but very convenient. There is also a bus stop right in front of the Condo for those who may need to use public transportation. I would recommend this place to anyone. We all wanted to stay longer! The kids asked if we could move in :) It truly is a home away from home. We're hoping to plan a trip back next year! Thank you Amanda for your nice review. I take the vacation experience of my guests very seriously. I know that they not only paid with hard earned dollars but also trusted me with something even more valuable-- their vacation time. I look forward to your return and hope you become one of my many guests who return each year. Great place to stay, lots of room and great views! Thank you for your review. I take the comfort and enjoyment of my guests very seriously. My unit features 3 very large bedrooms along with a separate laundry room to add to the spacious feel and comfort of my guests. Beautiful condo. Lovey location. Gracious and helpful host. I took my wife and kids down to Indian Shores/Clearwater for an early Christmas present, and absolutely loved it. Ed, the owner, was exceptionally gracious and helpful, and he answered all our questions about the property. His condo was really pretty and nicely updated; the balcony overlooking the gulf was our favorite part. It’s fully stocked and has beach chairs, fishing poles, and a few beach toys, which ended up being perfect for our kids. It’s right next to the sea bird sanctuary and only about 15-20 minutes away from Clearwater Beach if you want to go see Winter the dolphin at the aquarium. We all had a wonderful, relaxing week. Awesome host. Wonderful condo. Beautiful location. Highly recommend it. My family has stayed in six different places in the Indian Shores/Treasure Island area over the past few years for our annual Easter trip from Michigan, and this unit was by far the best we've experienced. Everything was tastefully decorated and we all mentioned how clean the unit was when we arrived. The grand kids found many toys for the beach, and there were chairs and umbrellas for us old folks. The pool and hot top were top-notch and well maintained, as was the grounds, parking lot, office etc. The fishing pier was also enjoyable. All employees were friendly and helpful. We will definitely return. Thank you for the great review of my condo. Assuring that my guests have a great experience is my top priority and I strive to provide a clean, comfortable and well appointed vacation home for my guests. I do not regard my condo as a rental property, but rather as my personal home away from home. I am truly delighted that you had a great time, and hope that you will become a regular return guest like many others. Rates subject to change without notice. Write for current quote & discount off listed rate. Rates listed are for 6 adults, children under 12 free. Children 12 or older are counted as adults. For over 6 adults, there is an added charge of $10/night/adult. Maximum of 8 adults & children. Two parking spaces can be made available upon request.